Welcome to the North Shore of Oahu, Hawaii. Here, you’ll find the most concentrated and celebrated stretch of world-class surf breaks on the planet. This region of the world is home to the famous Seven Mile Miracle. Ke Nui Beach House is a very spacious home and is situated right in the center of this miracle. With the notorious surf spot Gas Chambers is right out front, Rocky Point 100 yards to the right, and Pipeline is 300 yards to the left, one can simply not ask for a better location looking out at the world’s best breaks. The garden provides a direct beach access from the house from where the famous surf spots: Backdoor, Pipeline, Rocky Point, Sunset Beach etc…, are all within walking distance. There is ample outdoor seating, an outdoor shower and surfboard racks for your convenience. There are additional surfboard racks in the garage. The main floor of the house has a big open kitchen, a dining area that sits 10-12 people and living room with TV (cable/sat, Apple TV) with a view on the shore break. A large desk / workspace in living area with printer is available as well. On this level, you will find a bedroom with king size bed and full bath are located at the street side. The master bedroom, located on the first floor, has a king size bed, full bath and walk-in closet that is the full width of the house and to top it off, the room has spectacular views of the ocean. This level is also equipped with a lanai with several comfortable chairs that allow for a relaxing view of ocean and its sunsets. On the street side of the first level there are 3 roomy bedrooms with closets; 2 with double twins. These rooms share a spacious full bath. There is a desk in every bedroom and a safe in the kitchen. There is ample space for 3 cars to park on the street side and a garage with direct access to the house from the inside for your convenience. 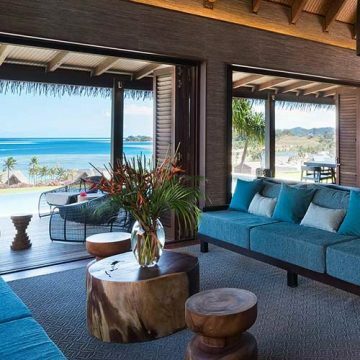 5 bedrooms, 3 bathrooms, Ke Nui is an amazing beach house and perfectly suited for extended vacations in Paradise. Advanced reservations are highly recommended and the minimum stay is 5 nights. The North Shore of Oahu is one of the most majestic surf destinations on Earth. Renting a house on the beach is the best way to enjoy your vacation with the added bonus you can fit up to 10 people in total comfort and enjoy one of the best views in surfing all day, every day. Ke Nui is a popular escape and is reserved early so planning ahead is imperative. If you want privacy and proximity over a resort or hotel experience this is the best choice you can make for your next Hawaii vacation. Hawaii is the spiritual home of surfing. It’s where it all began – the ritual, the boards, the ride. Hawaii has some of the most powerful waves in the planet, surrounded by pure volcanic nature. • Snorkeling; Best place to Snorkel is Shark’s Cove, Oahu—Location: 59-712 Kamehameha Hwy, Haleiwa, HI 96712 Just across the street of the parking lot there are some small shops you can retn gear and where you can buy food and drinks Sharks Cove has been rated by Scuba Diving Magazine as one of the “Top Twelve Shore Dives in the World”. • Waimea Falls is only 2 miles away, and hiking at Waimea Valley and visiting the falls is an unforgettable experience. Lanikai Pillbox Trail, If you’re looking for a less treacherous hike with similar sweeping views, the Lanikai Pillbox Trail may be perfect for you. Located just east of Kailua in the community known as Lanikai, the pillbox trail traces a ridge and passes two old World War II bunkers (pillboxes). Kaena Point, On the far western side of Oahu lies theKaena Point nature reserve, one of the largest seabird nesting colonies in the main Hawaiian Islands. The North Shore of Oahu is the most legendary stretch of surf coast anywhere in the world. Offering an incredible assortment of waves for surfers of all ability levels when the waves are small, this area transforms into a big wave mecca when the swell is up and the North Pacific Ocean churns to life. The entire island of Oahu has waves year-round and there are numerous websites that provide in depth details and maps for all the waves that we don’t need to go into details here. Your trip to Ke Nui puts you in the heart of the North Shore action and gives you the ability to paddle out anytime you want from your backyard and if you’re up for the adventure to challenge yourself when the swell picks up.